Cornet is a lamp of small dimensions, in all its versions, and particularly repeats the same structure formed by two conical pieces joined at their ends, one of which is an orientation adjustable shade for normal room lighting and reading tasks. Its aesthetics and name refer us to a Cornet, a wind instrument that has inspired Gabriel Teixidó give the shape of a Cornet to this family of lamps. Can be chosen in nickel matte finish, white or red. 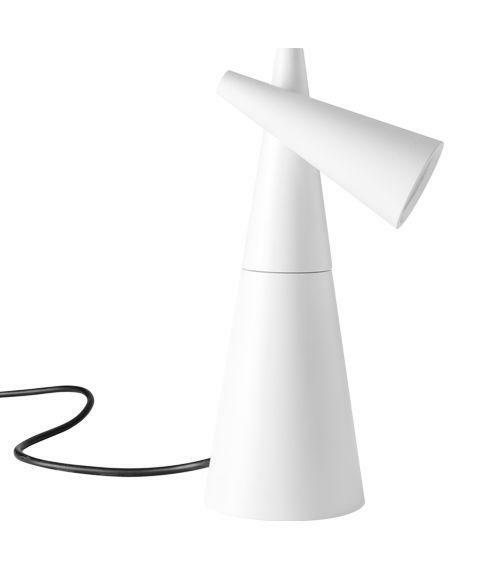 The desktop lamp version has an orientation adjustable base and a switch on the cable. All versions offer LED lighting. Metallic table lamp with a conical, adjustable head and rotating base. On/off cord switch.